Disclosure: I received the following outfit for review from The Good Ones. All opinions are my own. Guess what? 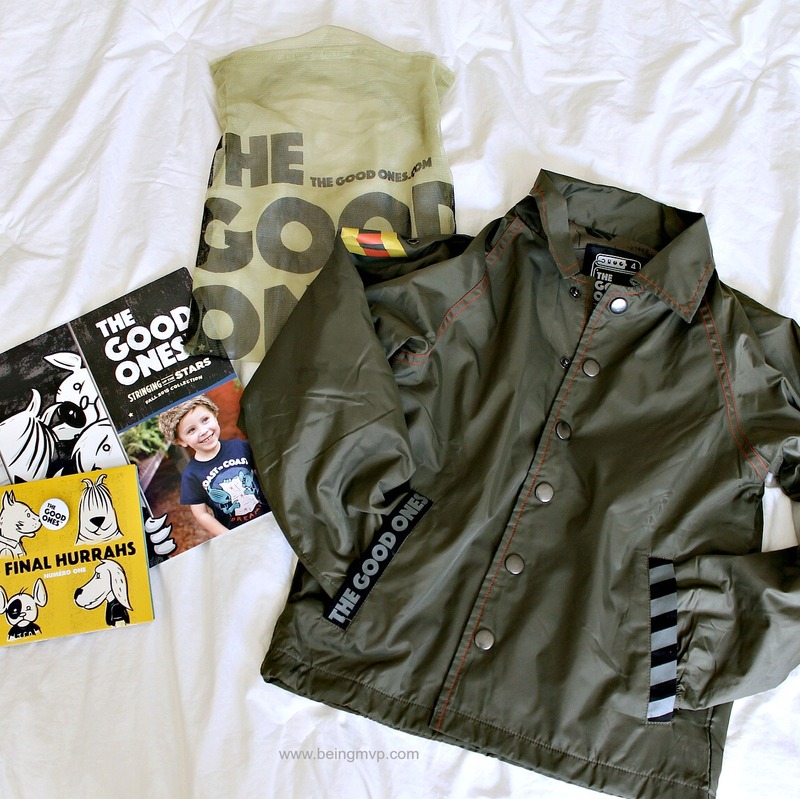 There is a new clothing collection from The Good Ones Clothing Co. just for boys who are adventurous, creative and ready for fun. That certainly describes Mason so I couldn't wait for him to see his new pieces. 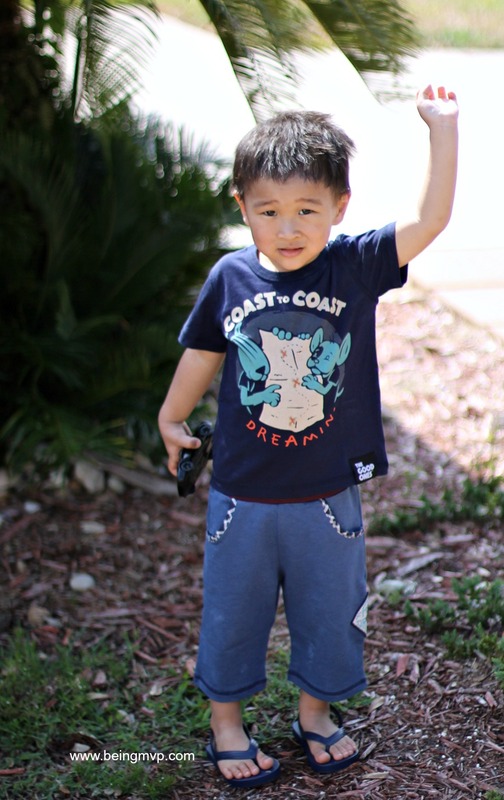 Mason is wearing the Coast-to-Coast Tee with Dreamer Shorts. The tee is great. It is supersoft and features a make believe band - The Final Hurrahs (get your kids rock & roll cd today). Since Mason is a natural born dancer and grooves at the sound of any genre of music, he is ready to rock. 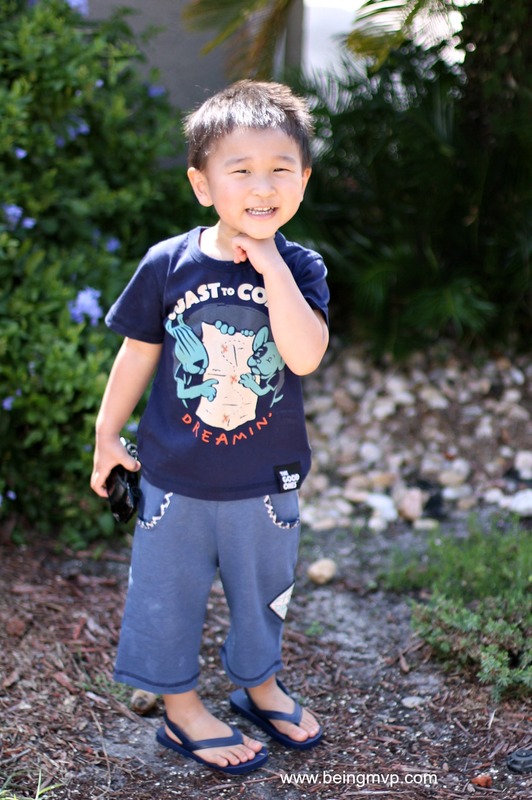 The shorts are soft and comfortable with a longer length which is awesome when exploring and playing. There is a “Free to Dream” appliqué on one side and the contrast trim on pockets with colored waistband is a wonderful touch to the design. The World Tour Jacket is rad. It is reversible so your tot can wear the side that fits his mood that day. It's great for a rainy day, a windy day, a chilly day or any other day that your mini me wants to wear it. It comes in even sizes so the 4 is a tad bit large on Mason but he doesn't care and is rocking it like a boss. Now just needs some groupies - - just kidding. I love the Zoo Over Zurich cardigan, so preppy! I would get the ADVENTURE CLUB JACKET for my nephew. I might get the World Tour Jacket for our son. I would get the world tour jacket in a size 10. I think I would get the Zoo Over Zurich cardigan for my son! My boys would love the gravity free t shirts. Visited the site and I would love to get the ZOO OVER ZURICH CARDIGAN for my son. FRANK PANTALONES for my son. I would get the BMX CLUB TEE! I like the gentleman's western shirt. I would get if for my nephew. If I won I'd get the Everything Is Good Tee for our son! I'd get the ACHTUNG! TROUSER for my son. I would get the Frank Pantelones for my son! I would get the Frank Pantaloons for my nephew. I would choose the T-G-O-RAMA PANTS for my friend's son. STAGE STACK TEE (adult) cute shirt love to wear it. I would get the WORLD TOUR JACKET for my nephew. I love the BE COURAGEOUS TEE! It would be for my little cousin.